For this week's upper primary teaching tip we're going to explore the importance of giving your upper primary students recognition. Does your school have perks for the older students? Everybody loves to have something that signifies they're moving up in the world and upper primary students are no different. Maybe they get to sit on chairs at assembly or be house captain or chairperson of the SRC? These perks are a great way to show recognition of their senior position within the school and are some of the first things students mention when asked what they’re looking forward to about being in Year 6. You can do this in your classroom as well, by including students in their learning, asking for their ideas and opinions and providing fun self-directed learning activities (with your guidance of course). Listening to students and allowing them to have a say in classroom management is a great idea too. 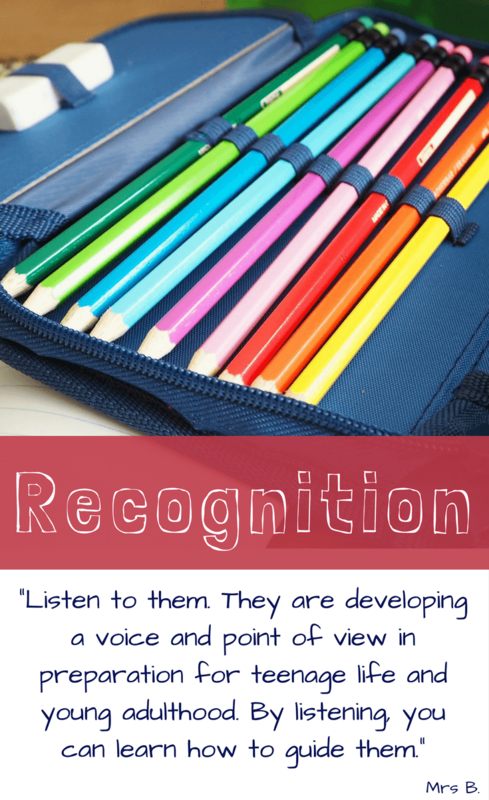 Here are a few ways you can give your students recognition in the classroom and wider school community. Allow students the choice of where and how they sit in the classroom. This will need to be managed and have set rules and expectations but it is a great way of allowing students to demonstrate their growing maturity through making choices and behaving responsibly. I rarely make older students line up to move between classes or around the school. I also rarely make them sit on the floor to listen to stories or hear instructions. I find sitting on the floor for extended periods uncomfortable and so do they. They also find it a bit demeaning which isn't conducive to a great relationship. Obviously there are times when I've needed them to line up and I find because it's such a rare occasion they do it quickly and quietly because they realise for something important (like a head count on excursion or class photos or during an evacuation drill). Relaxing your stance on things like this is a small but very effective way to show students your recognise their position as older students and they respond well to it and feel proud that they no longer need such strict procedures and protocols. That said, it still needs to be managed by you. If they aren't able to demonstrate the maturity to move around the school as a quiet sensible group or sit at their desks without being distracted go back to lining up and sitting on the floor and try again later in the term when you think they might be ready. Also, explain to them what your expectations are and that you believe they are capable of doing this so it's up to them to show you. These are just a few of the possible ways you can give your students recognition as the senior students in your primary school. There are many other ideas and tips for teaching upper primary students and I will explore these further in future posts. 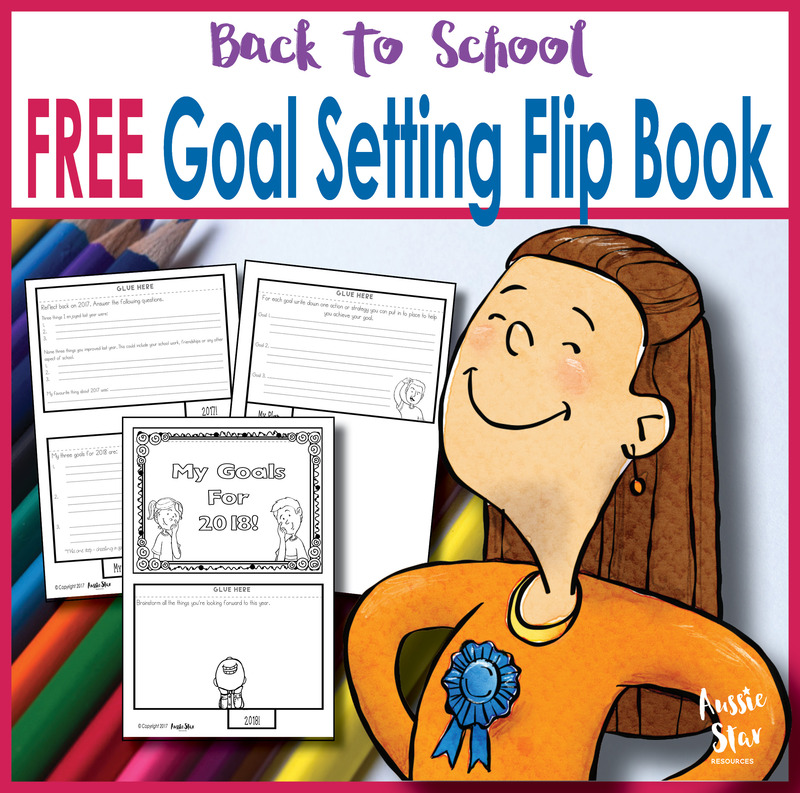 In the meantime sign up for VIP access, in our free resource library you will find our Goal Setting Flip Book which is the ideal way to start the year with your class. 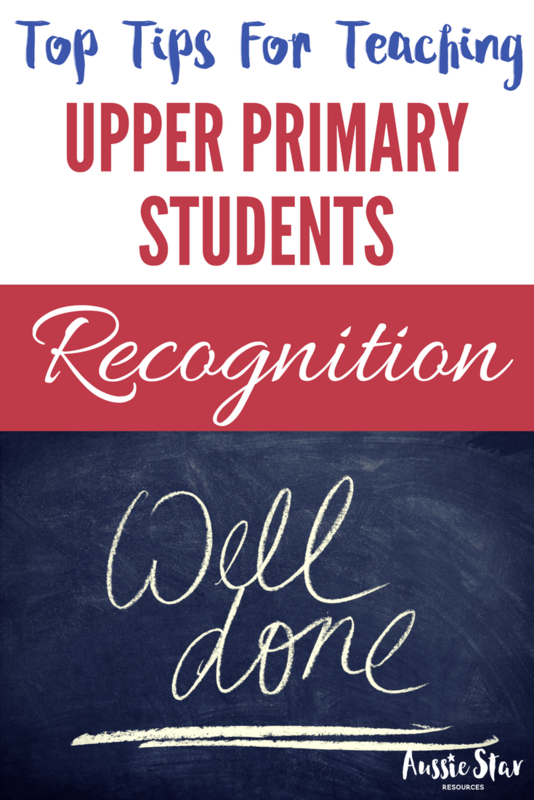 I'd love to hear from you about how you provide recognition for your upper primary students. Having the right resources can take your lessons to the next level and really reduce your stress levels. 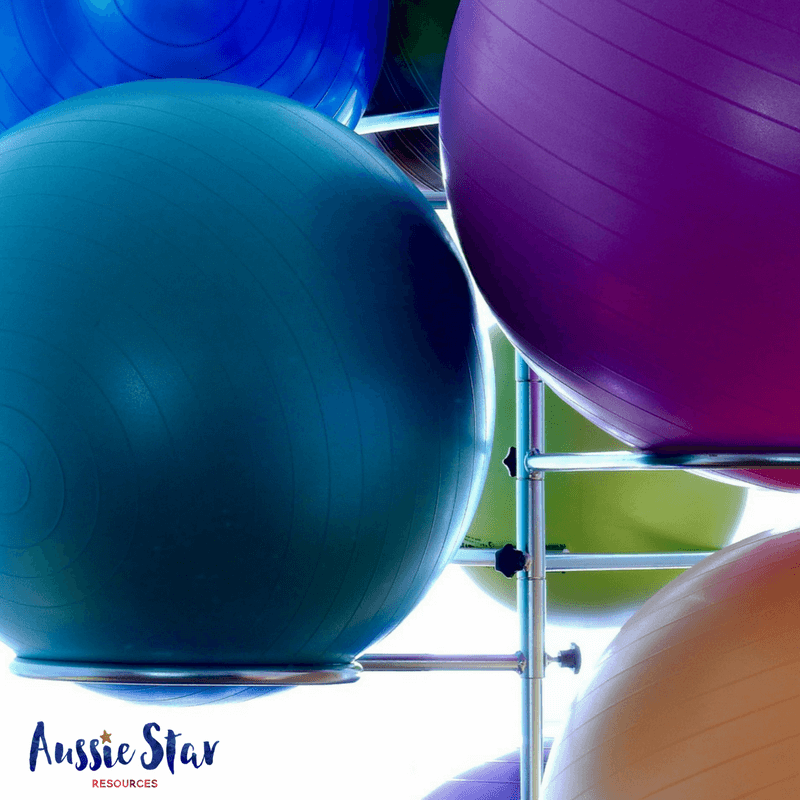 Here are my go to Australian Federation teaching resources that are sure to make teaching this boring topic far more interesting and fun - for you and your students. Need a crash course in Australian Federation? If you feel that your understanding of Federation needs a refresher check out our posts on Engaging your Students with Federation and The Argument for Federation. Basically, Federation happened in 1901 (after many years of discussion and debate) when the colonies voted to become one nation with a Federal Government that serves the people of Australia and is bound by the Constitution. 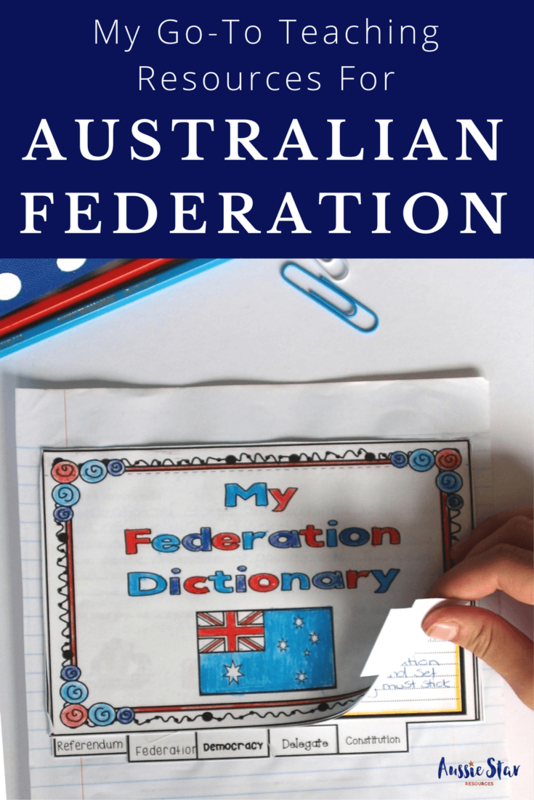 If you're looking for more facts and figures and information about Federation and the events that led to it check out the Australian Electoral Commission Education website it has fact sheets that are full of information! The National Archives also have several resources that you might find helpful, especially about how the constitution was drafted, reviewed, edited, reviewed and eventually voted on. You can check out this information by clicking on this link. 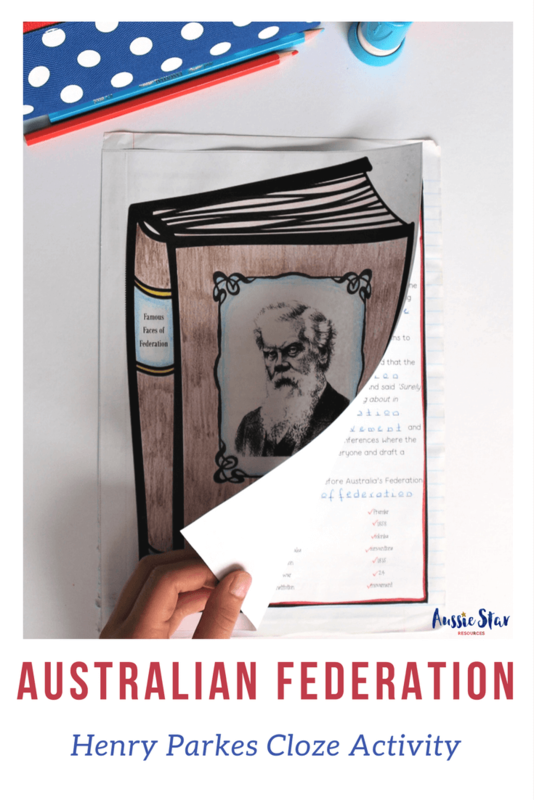 This PDF fact sheet from the Parliamentary Education Office is also a handy reference about Australia’s Federation. The PEO are a great place to start if you’re looking for information about Australia’s political history. Australian Federation teaching resources at the ready! 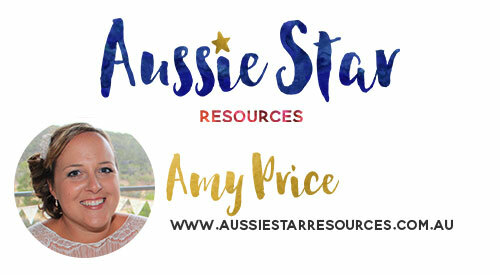 My despair at the lack of Australian Federation teaching resources was the catalyst for Aussie Star and I've received a huge amount of feedback from teachers expressing delight and gratitude for our range of Australian Federation resources. Here is a brief rundown on what's available. This was the very first resource that I ever created and it has recently been updated to be even more engaging and interactive. It is a great discussion starter and is a simple but highly effective way to help students identify and sort the reasons for and against Federation. With every new topic there are always a few key words that students need to be able to understand to fully grasp concepts. 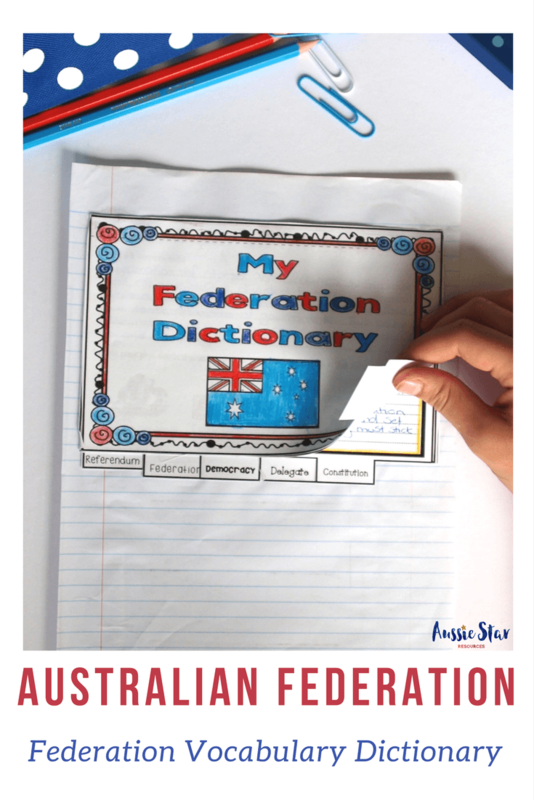 This flip book dictionary has 6 words that are all related to the topic of Federation. Students are required to define each word and practise using it in context. They are then able to assemble their dictionary to form a funky little flip book that they can refer to later. This activity is great fun! 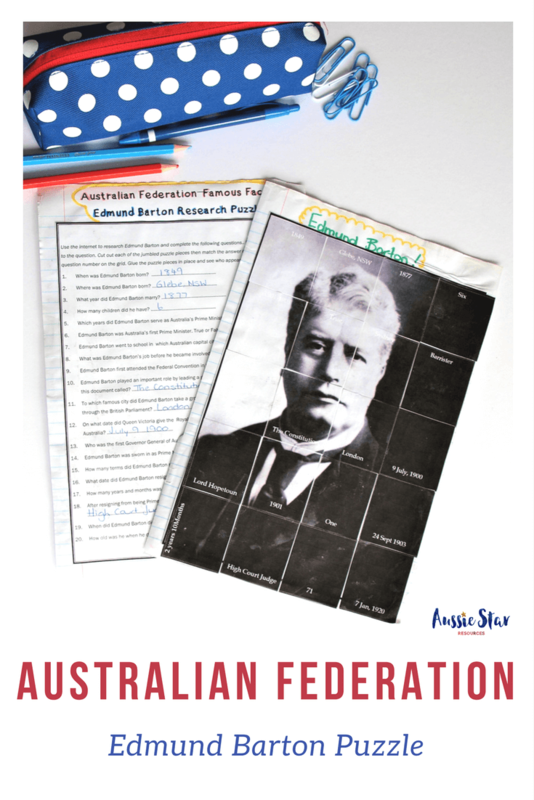 There were several gentlemen who were instrumental in bringing about Federation and this resource is designed to introduce them to your students. They will be able to conduct their own research to find out key information about each person and then enter it in to their Hall of Fame. Once they've got to know these famous faces of Federation they can create a grand double door entrance for their Hall of Fame. Timelines are a prominent feature in the Australian HASS Curriculum and with good reason. The road to Federation was long and filled with debates, draft constitutions, more debate and a couple of referendums. Without understanding the process students won’t really appreciate the significance of the decision to Federate and how it impacted the development of the Australia they know today. 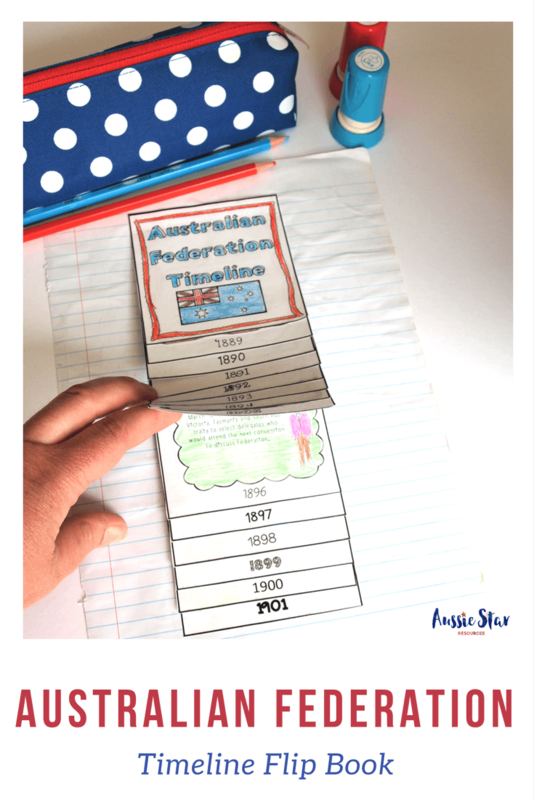 Creating foldable timelines is a great way to make sorting information into chronological order interesting and memorable. While not the most exciting bloke Henry Parkes was a major advocate for Federation. He traveled around and gave long rousing speeches about the reasons Australia should Federate. This cloze activity is a great way for students to meet Henry and learn about his role in Federation. Edmund Barton was our first Prime Minister and another advocate for Federation and is therefore, worth getting to know. This activity requires students to research information about Edmund and use their answers to unjumble the puzzle to form his image. 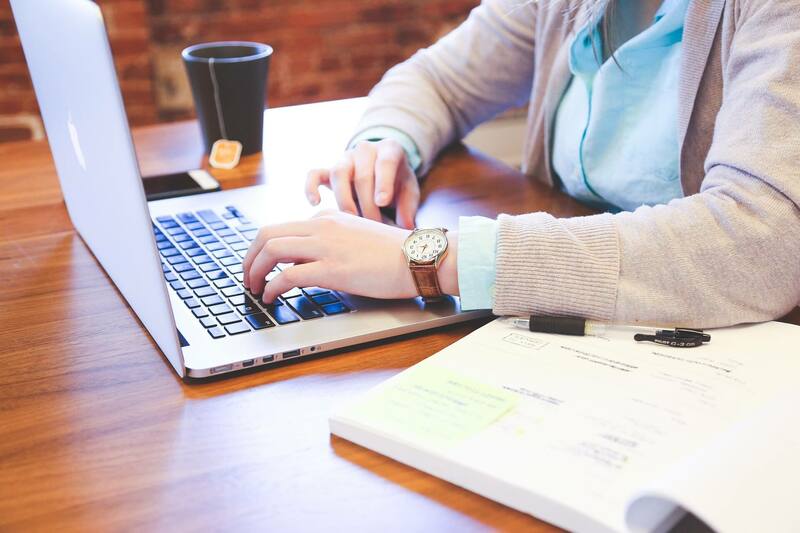 They must also record the websites they used and the keywords they entered to demonstrate their ability to use reliable information sources and search efficiently. 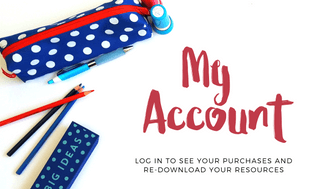 Each of these resources is available in our shop for immediate download. Teaching Federation can be fun and interactive, it is a pretty boring topic but by using some of the ideas above hopefully you can spice it up for your students. Let me know if you have any other ideas that you've found helpful in your classroom to teach Federation. I'd love to hear about it. 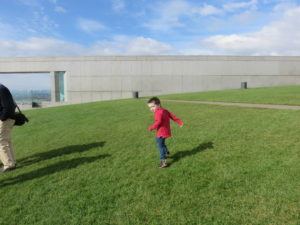 I’ve mentioned previously that the Aussie Star family traveled to Canberra earlier this year. 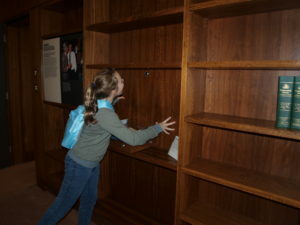 There’s no question that the Museum of Australian Democracy (or Old Parliament House) was the highlight of the trip for all of us but particularly for Miss 11. We went twice and if she’d had her way we would have gone back again. She rated it even higher than Questacon! I also have no doubt that Grace got a great deal out of it from an educational perspective since she is in Year 6 and has been learning about Australian Government in her HASS classes at school. She spent ages reading information plaques, interacting with the touch screens and following their instructions to move around the display. 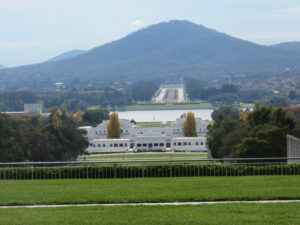 Given her enthusiasm for Old Parliament house I asked her for her Top 5 reasons to visit the Museum of Australian Democracy as part of your trip to Canberra and here’s what she said. 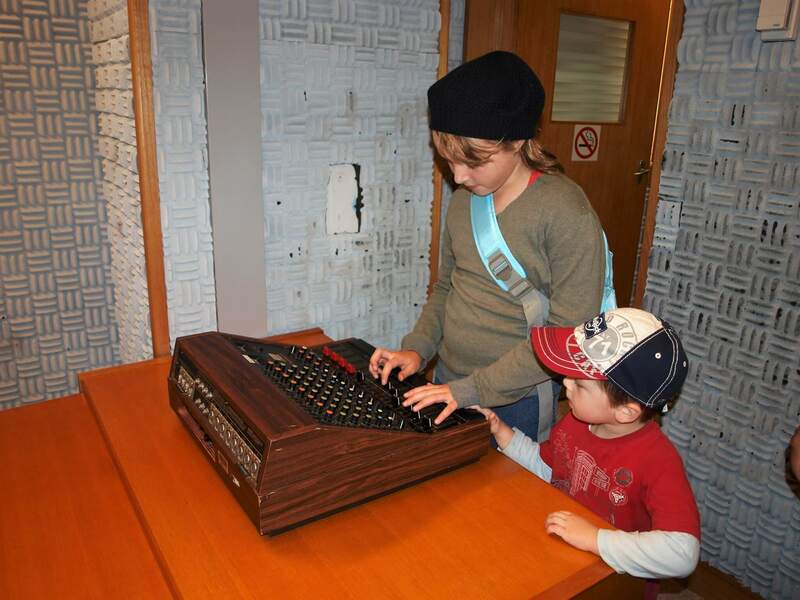 I liked that they had loads of hands-on things to do. It was so cool sitting in the big seats in the Upper and Lower Houses. I liked that you could spy on the Prime Minister in his office through a spy hole! It only cost $5 for the whole family. What a bargain! They have a little kid’s area and an awesome dress-up photo area. All day fun with an Australian History lesson too! 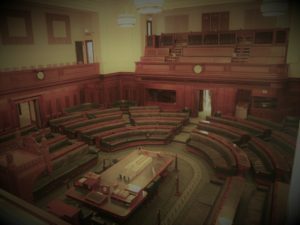 There’s not much that’s off limits at Old Parliament House. Grace and Mr 3 loved sitting on the deep worn leather seats in the Upper House and Senate, they’re surprisingly comfortable and I can understand how they could be tempted to nod off during parliament! 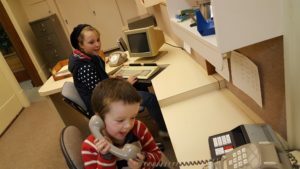 The Speaker of the House’s office was very plush and while you’re not allowed to sit at the official desk you can sit at the secretary’s desk and have a great time looking efficient typing away and answering phone calls like these two monkeys. Hands on fun in the press room. The Press Room was also a favourite, sitting in the sound proof booth and reading a press release for others to hear in the next room was a highlight as were Bob Hawke’s office, the dress-up room and the Cabinet room with its sound proof door and plush interior. For parents of little people there’s an excellent playroom that kept our little guy entertained for ages and gave us all a place to rest up before more exploration. 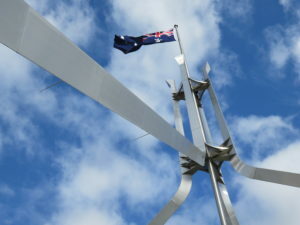 If you’re heading to Canberra, either on your own or with your class for camp, make sure you add The Museum of Australian Democracy to your itinerary. I’ve been twice as part of a school group and the guides are wonderful however, I would allow time for small group exploration if you have enough teachers and parent helpers. I saw more, and engaged in the museum more, by just being free to wander the halls and explore so if you have time this is worth doing after your guided tour. 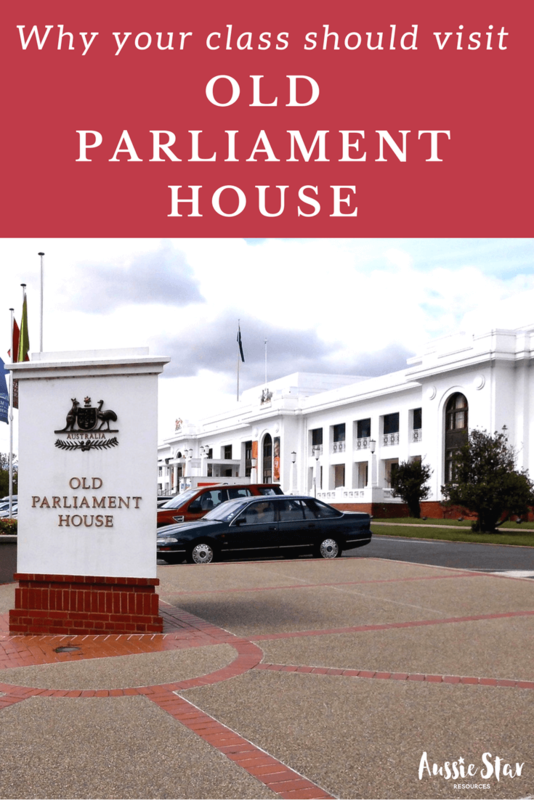 So, there you have it, Grace’s top 5 reasons to visit Old Parliament House in Canberra and my quick run-down to back them up. The museum really has been well planned and organised to maximise learning opportunities and to genuinely engage students with Australia's democratic history. Make sure you visit when you’re in town. If you’re looking for some more information their website is very helpful. 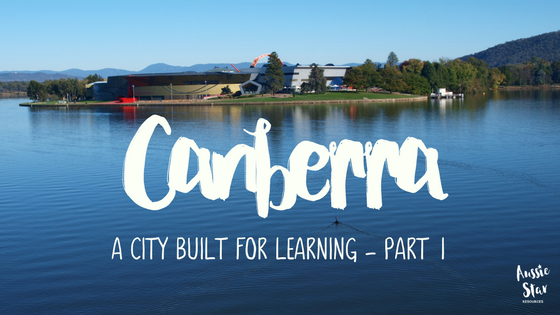 I’d love to know your favourite place to visit in Canberra or the highlight of your school trip so feel free to leave a comment below. I loved learning about the Australian Explorers waaay back in 1986 with one of my favourite teachers Mrs Gunn (awesome name for a teacher hey? #dontmesswithher). It was one of my favourite topics at school and I can remember being enthralled with stories of Captain Cook and his adventures, fascinated by the mystery of Ludwig Leichhardt and his disappearance, and baffled by the poor choices of Burke and Wills. The topic of explorers was exciting and interesting, so much so that 30 years later I can still remember it. Starting a new topic in any subject is exciting, the students are ready to move on to something new, and let’s face it, we usually are too. Starting a new topic well is vital and sometimes this can be a challenge and kill the fun before it gets going. 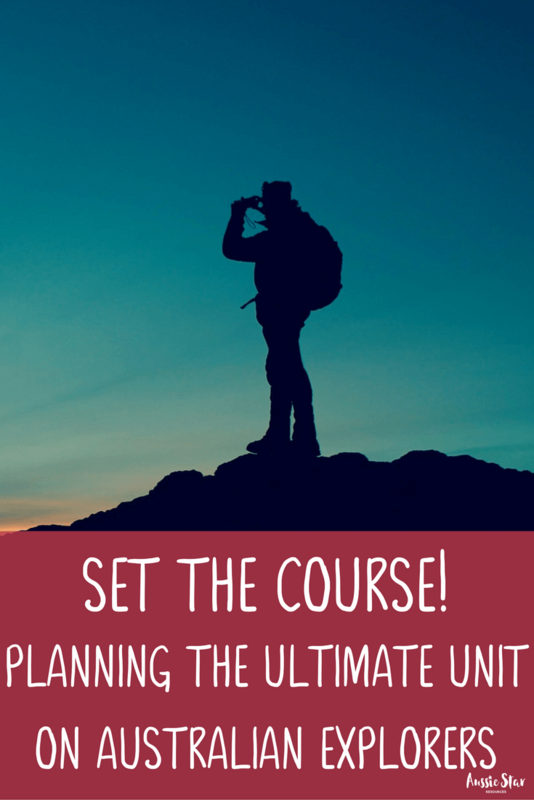 To help you get your Australian Explorers teaching unit off to a great start I’ve put together some ideas that might help you get your classroom expedition ready and inspire your students. Decorate your classroom to look like the inside of a ship. 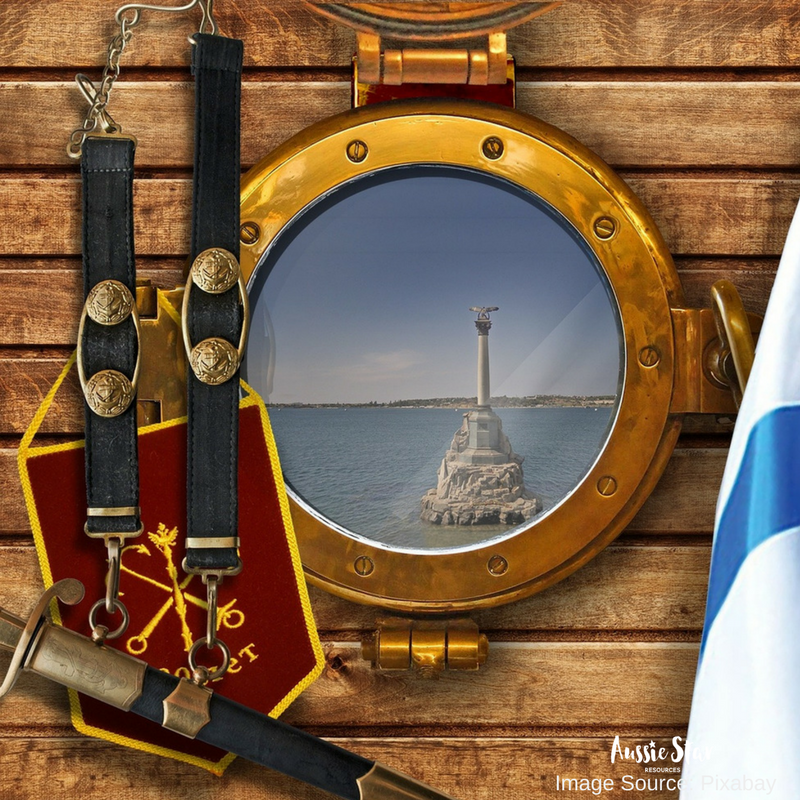 Raid op shops, garage sales and antique shops for old furniture, wooden chests of various sizes, vintage looking bottles, books, telescopes, boating paraphernalia such as buoys and ropes, and other bits and pieces. Consider a new teacher chair that is worthy of a ship’s Captain or a wooden chest that holds dodge balls and cricket bats. 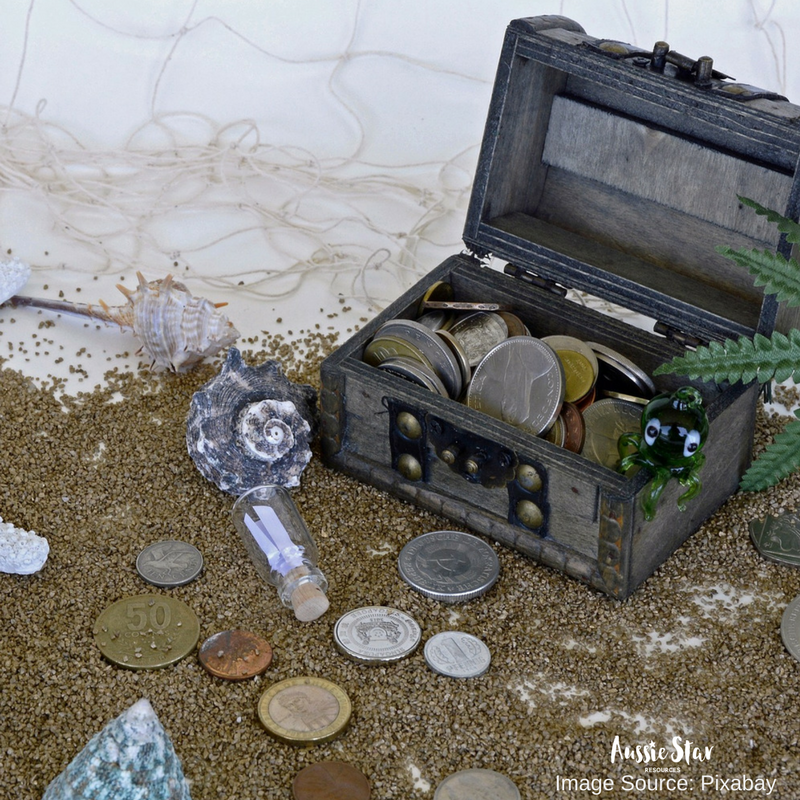 Setting the scene will help your students to connect with the Australian explorers and give them some hands-on fun to engage with the topic outside of HASS lessons. Guide your students to your new topic by inspiring them with old maps, drawings, letters and diary records. There are many images available online of detailed drawings done by Botanist Joseph Banks while on his voyage with Captain James Cook. There are also many images of captain cook’s journals. 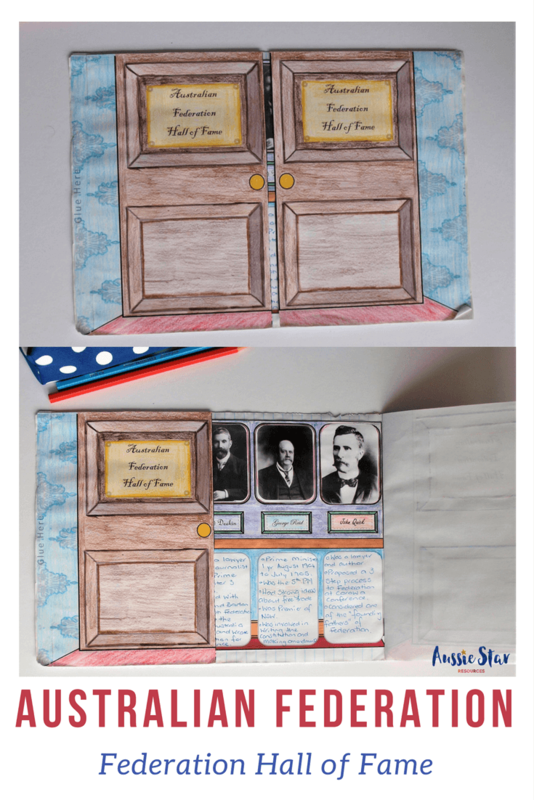 Or you could even create your own aged looking journal that students can record the day’s events in. If you are lucky enough to have a quill and ink pot this would add to the authenticity. 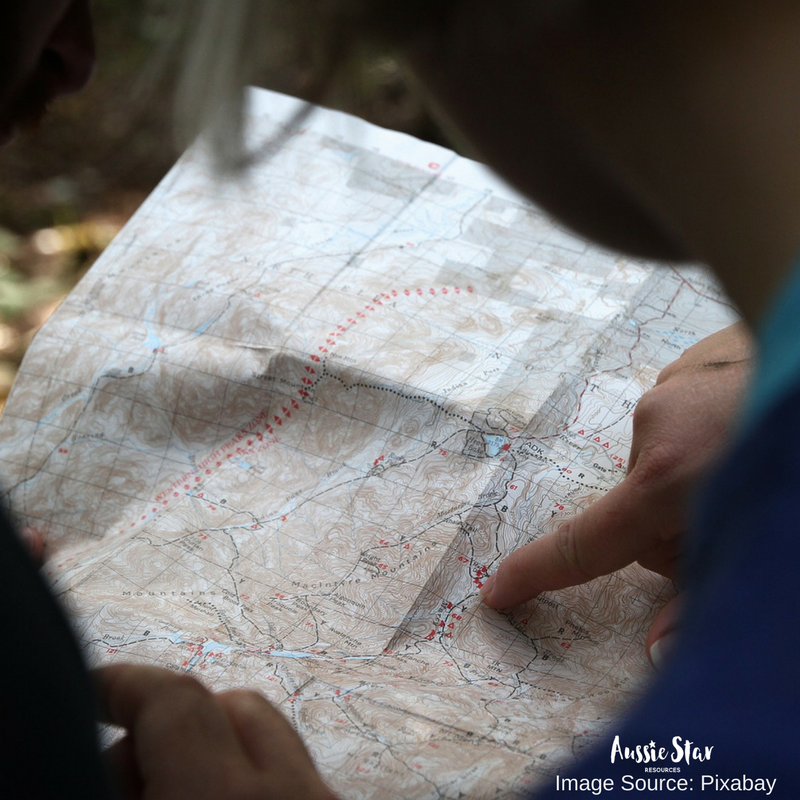 Map shops and online suppliers have vintage maps that can be purchased and laminated for later use. 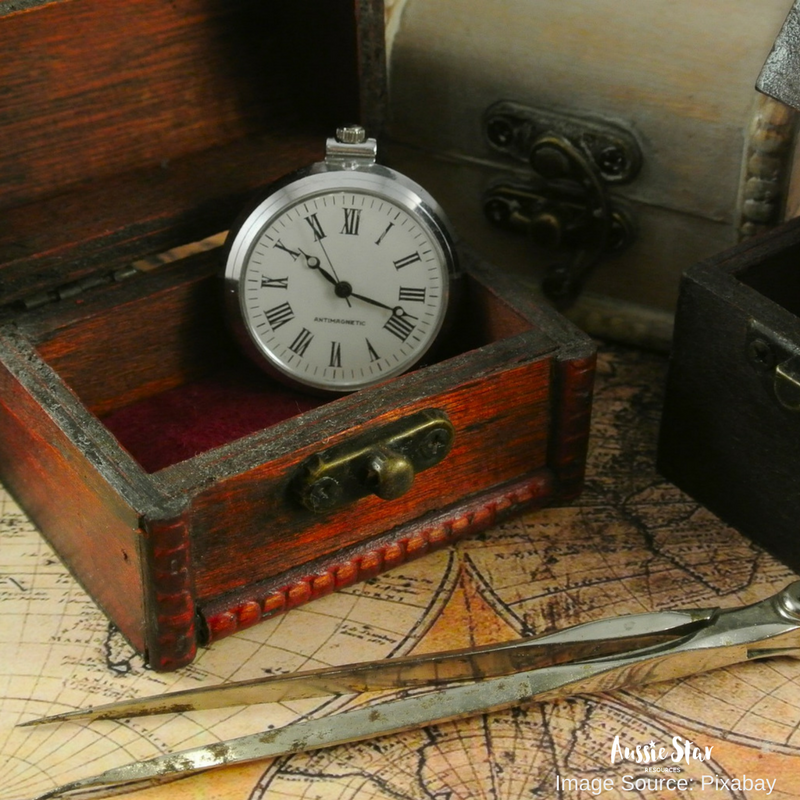 Dress ups are still loved by older students and some rough and ready explorer attire can help set the mood and inspire your students to get in to character. 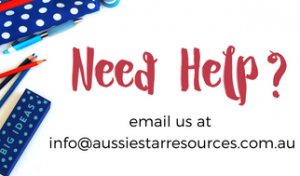 You may even have a local theatre group who may like to come in and help the students dress up and act out the story of the Australian explorers. Your local Maritime Museum may have some helpful advice too. I love to decorate the windows of my classroom – Cut out circles to create portholes or if your school allows it paint them to create a desert scene or ocean waves. If your school doesn’t allow painting on the windows I have seen a very clever solution! Stretch Cling wrap across the window, secure with clear sticky tape, and then paint on the Cling Wrap! It can easily be removed by peeling off. Genius! I hope you've found these ideas helpful! If you're looking for more inspiration I’m always adding more ideas to my Australian Explorers Board on Pinterest. 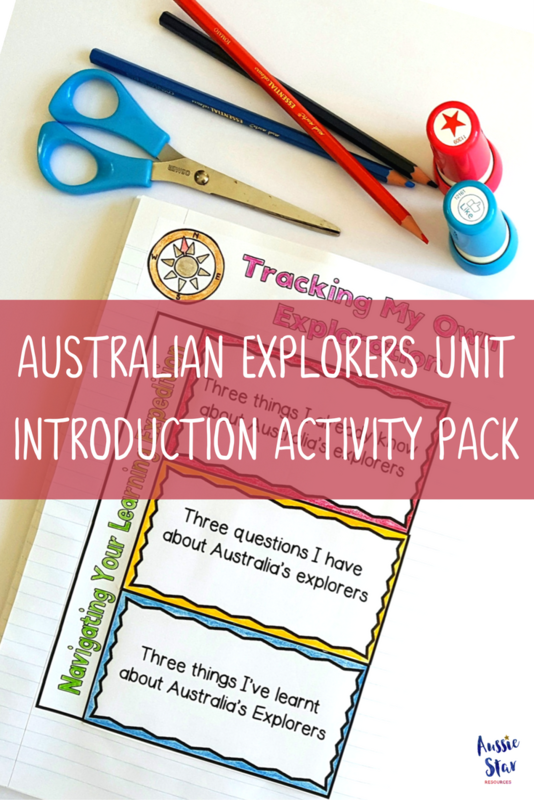 If you're looking for a great start to your unit on Australian Explorers our Australian Explorers Intro Pack with 5 activities is the perfect solution. Click on the image to check it out!